In this study, novel Zn–Cu hybrid particles were prepared by a simple displacement reaction. In this displacement reaction Zn powder and CuSO4 aqueous solution were used as reactants. By adjusting the amount of Zn powder, Zn–Cu particles with different Zn:Cu weight ratio (2:1, 1:1, and 1:2) were prepared. Scanning electron microscopic images showed that these Zn–Cu particles had special flake-granule hybrid structure. Cu granules were attached onto the surface of Zn flakes. These Zn–Cu particles were used as conducting fillers in the epoxy (EP) matrix. 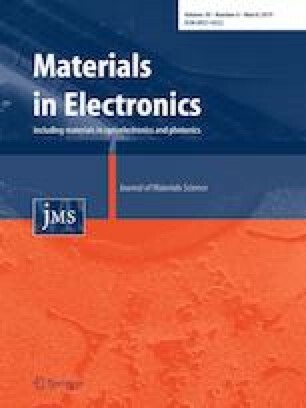 Thermal conductive and dielectric performance of EP-matrix composites reinforced with different Zn–Cu fillers was investigated. Compared with the EP composites with pure Zn powder, the composites filled by Zn–Cu particles displayed higher thermal conductivity and dielectric constant. The Zn–Cu(1:2)/EP had a thermal conductivity of 0.5008 W m−1 K−1 and thermal diffusivity of 0.3158 mm2 s−1. The thermal conductivity enhancement value of the 20%Zn–Cu(1:2)/EP composite reached 137.9%. The dielectric constant of the 20%Zn–Cu(1:2)/EP at 1 Hz reached 34.56. In this study the thermal conductivity of the composites is mainly affected by the thermal conductivity of the fillers and the dielectric property is mainly affected by the filler shape. This work was supported by Project Funded by the Priority Academic Program Development of Jiangsu Higher Education Institutions (PAPD), the National Natural Science Foundation of China (51603102) and the China Postdoctoral Science Foundation (2018M630554).